Shadow box production - base method. Unknown builder, good condition, no crates. 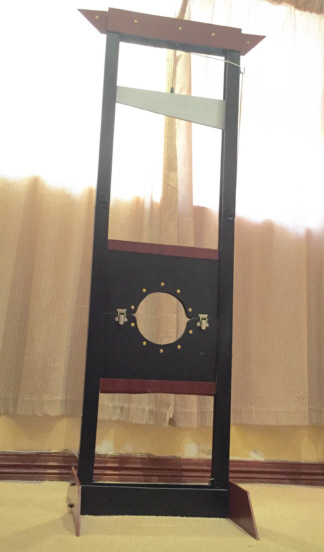 Slightly smaller guillotine, stands about 1.5 m high and about 0.45m wide. Spectator places head in the chopper and blade falls and passes through their neck without any harm. Folds small, light and portable, projects big, Ideal for small stage shows. It is an illusion designed by Rand Woodbury in Illusion Works. The illusion was built in Argentina. It is for the appearance of a magician or his assistant at the beginning of the show. Just cover the cage with a cloth and uncover for the appearance. Cast aluminum and includes 2 ATA Cases. It is an illusion using a single assistant. Assistant enters the box and the magician pushes the blades through the entire box. Opening the box the assistant has disappeared. Then the magician opens the box and the assistant reappears. It comes with 2 ATA Cases. 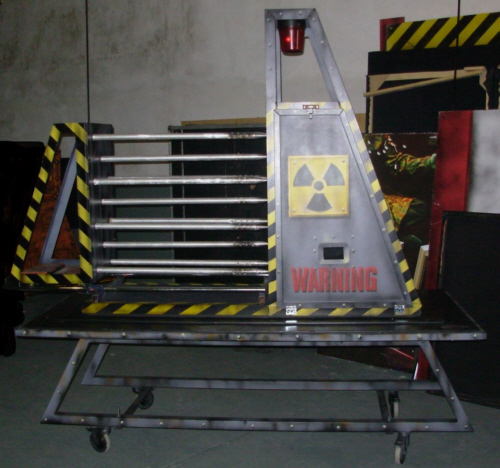 This illusion breaks down for easy transport and storage. For those who work cruises, this is an excellent stage illusion and has already been used on the QE2. Pickup Only - Lancaster UK. JukeBox theme - One of the visually stunning illusions for an audience to view. There appears to be no place for an assistant inside the cube zag.